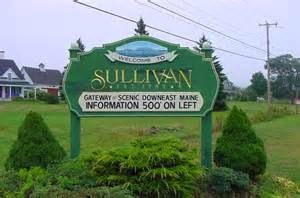 I am going to give you a synopsis of this remarkable true ghost story at the beginning of this post and for those who wish to follow it even closer(verbatim transcripts along with accurate, first-hand, meticulous accounts), simply continue reading In Depth Maine Haunting below. One of America's first documented, authentic ghost stories is the Nelly (Hooper) Butler haunting. She was born in 1774 to David and Joanna Hooper, one of seven children. The Immortality Proved by the Testimony of Sense, a pamphlet printed in 1826, has an account from the Reverend Abraham Cummings, an eye witness to the haunting in Sullivan, Maine, although there were hundreds of witnesses. some of the transcripts are shown below in In Depth Haunting. Nelly died within a year of marriage as she was giving birth to her first child, who also died. Although the deaths were considered natural, there was wide speculation as the the true cause of death, even fingers pointing to foul play on behalf of her husband, George Butler. Even after a trial in which he was found not guilty, suspicion still lingered. George wanted to marry a certain Lydia Blaisdell, born on March 2, 1772 at New Hampshire and the daughter of Captain Abner Blaisdell. But because of these suspicions, both George's father(Moses) and Lydia's father ferociously opposed this marriage so it was put on hold indefinitely. But oddly enough, one person actually condoned this union! Thinking these disturbances peculiar, yet not troublesome, on January 2 of the following year, a female voice from cellar was heard stating that it was Nelly and that she desired her father(David), her former husband(George) and Lydia's father(Capt. Abner) to gather to confirm that she was indeed speaking to them from beyond. The three requested people met, as I am sure many others, and confirmed that Nelly had transcended the spirit realm to communicate with them. No physical sign of Nelly was observed until may of 1800, then her ghost materialized wearing a shining white garment in front of about 20 people at the home. How that many people were gathered(and why) to witness this is unclear. According to eyewitnesses, "At first the apparition was a mere mass of light, then it grew into a personal form, about as tall as myself...the glow of the apparition had a constant, tremulous motion. At last, the personal form became shapeless, expanded every way and then vanished in a moment." Other witnesses said that the ghost had "a shining halo around her head" and her voice was "shrill but milk and pleasant." On another occasion, Nelly showed herself in front of 200 eye-witnesses to foretell the deaths of Capt. Blaisdell's wife and father, as well as the date of her earthly husband George and Lydia. "White rocks floated up from the ground, joined together and took the shape of a rose-tinged orb, which suddenly flashed and manifested into the form of a child-sized woman. When the Reverend spoke to it, the figure expanded to normal size with rays of light shining from her head all about and reaching to the ground." It was upon the belief in the adage "seeing is believing" that the Rev. 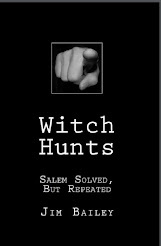 Cummings published his book, excerpts which can be viewed in my continuing post In Depth Maine Haunting below. George and Lydia did marry after all but sadly, Lydia died soon after(May 13, 1802) while giving birth to her first child, as did Nelly. Even after Lydia died, Nelly hung around for a bit longer, requesting the re-internment of her baby's remains in a different area. It is said by almost one hundred people attending this solemn re-internment, that Nelly appeared before all and sang hymns, quoted scripture and prayed. There were many who believed that Lydia, herself, was playing parlor tricks on everyone so that her and her betrothed could marry peacefully. However, these 'nay-sayers' soon had their voices squelched when "Nelly" appeared many more times after Lydia's death. George remarried a Mary(or Polly as some records indicate) Goggins on September 12, 1805 and together, they had seven children, with all surviving. This phenomena seems to have slowly died out as the years continued on, with no more accounts of Nelly after a couple of years after Lydia' death. But the legacy lives on in many stories and will always be remembered as the most recognized haunting in all of America, certainly the most documented. It is reported that Nelly was often seen walking alongside the future Mrs. Lydia Butler oftentimes, even during broad daylight. Nelly is recorded as visiting neighbors and various residences throughout Sullivan, walking from room to room in spectral fluidity. When anyone became alarmed, she would graciously assert that she would not intrude upon their presence, but meet with them whenever they wished to see or converse with her in the cellars of their dwellings. In the cellar of Capt. Abner Blaisdell's home, "she conversed for several hours on different occasions with the crowds who flocked thither to witness the manifestations. Sometimes she appeared to a number of persons at a time, occasionally in the likeness of her former self, but still oftener in a fleecy mass of white shadowy light." As the Rev. Abraham Cummings has given several very interesting and minute details of the modes in which the ghostly visitant's presence was regarded, besides having published in full the affidavits of the whole forty witnesses examined on the trial, here are quotations from this pamphlet, for the better understanding of the marvelous circumstances. The times, places, and modes of her appearing were various. Sometimes she appeared to one alone, sometimes to two or three, then to five, six, ten, or twelve, again to twenty, and once to more than forty witnesses. She appeared in several apartments of Mr. Blaisdell's house, and several times in the cellar. She also appeared at other houses, and in the open fields. There, white as the light, she moved like a cloud above the ground in personal form and magnitude, and in the presence of more than forty people. She tarried with them till after daylight, and vanished; not because she was afraid of the sun, for she had then several times appeared when the sun was shining. Once in particular, when she appeared in the room where the family were, about eleven o'clock in the day, they all left the house; but convinced of the impropriety of their conduct, they returned. At another time, when several neighbours were at the house, and were conversing on these remarkable events, a young lady in the company declared that, though she had heard the discourse of the spectre, she would never believe that there had been a spectre among us, unless she could see her. In a few minutes after, the spectre appeared to several persons, and said she must come into the room where the company was. One of those who saw her, pleaded that she would not. She mentioned several incidents of her past life, known only to her husband, as he declared, and asked him if he remembered them. He said yes. She asked him if he had told them. He answered no; and of such a nature were those incidents as to render it utterly improbable that he ever should have mentioned them before. This was at the time when he attempted to handle the apparition. Once, when she conversed with about fourteen persons, Mr. Blaisdell, having heard that his father was sick, asked the spectre whether she knew anything, or not, concerning him. He afterwards found that his father, two hundred miles distant, died three days before this answer of the ghost, and his friends at York, where his father lived, utterly deny that they sent the news in the course of these days. At the time when fifty people heard her discourse, while more than forty saw her, to some of them \ who no more believed these extraordinary events than mankind now do in general \ she mentioned several occurrences of her past life, known to them and her, in order to satisfy them that she was the very person she professed to be. Almost all this company had been acquainted with her in her life-time, and a considerable number of them very intimately. She desired that any of them would ask what questions they pleased, for the removal of any doubts respecting her. Accordingly certain persons did propose several questions respecting a number of events in her past life. To all these inquiries, she gave completely satisfactory answers. She foretold what the opinion and conduct of mankind would be with regard to her, and the ill-treatment which Mr. Blaisdell's family would receive on her account. She not only declared the necessity, but foretold the certainty of the marriage at an hour when both the parties and both the families opposed it. Within thirty hours after Mrs. Butler's marriage, the spectre predicted that she would become the parent of but one child, and then die. Ten mouths after this her child was born, and she died the next day. The safe return of one bound to the West Indies was also foretold and accomplished. These predictions are all fulfilled, and were previously and sufficiently known in this vicinity for evidence that they were such. She uttered several other predictions now accomplished. Some time in July, 1806, in the evening, I was informed by two persons that they had just seen the spectre in the field. About ten minutes after, I went out, not to see a miracle, for I believed that they had been mistaken. Looking towards an eminence twelve rods distant from the house, I saw there, as I supposed, one of the white rocks. This confirmed my opinion of their spectre, and I paid no more attention to it. Three minutes after, I accidentally looked in the same direction, and the white rock was in the air; its form a complete globe, white, with a tincture of red, like the damask rose, and its diameter about two feet. Fully satisfied that this was nothing ordinary, I went toward it for more accurate examination. While my eye was constantly upon it, I went on four or five steps, when it came to me from the distance of eleven rods, as quick as lightning, and instantly assumed a personal form with a female dress, but did not appear taller than a girl seven years old. Immediately she grew up as large and as tall as I considered that woman to be. Now she appeared glorious. On her head was the representation of the sun diffusing the luminous rectilinear rays everywhere to the ground. Through the rays I saw the personal form, and the woman's dress. Then I recollected the objection of the Encyclopedia, that ghosts always appear to one alone. Now, said my mind, I see you as plainly as ever I saw a person on earth; but were I to converse with you an hour, what proof could I produce that I ever conversed with you at all? This, with my fear, was the reason why I did not speak to her. But my fear was connected with ineffable pleasure. Life, simplicity, purity, glory, all harmonizing in this celestial form, had the most delightful effect on my mind. And there appeared such a dullness afterwards upon all corporeal objects as I never perceived before. I went into the house and gave the in- formation, not doubting that she had come to spend some time with us, as she had before. We went out to see her again ; but to my great disappointment, she had vanished. Then I saw one of the great errors of my life. That I had not spoken to her, has been the matter of my regret from that hour to this. Some time in March, 1806, she talked a few minutes without appearing, at eight o'clock in the morning, and promised to come again that day; at two o'clock she performed her promise, and talked with four people two hours. This conversation was indeed in the cellar, but the place was enlightened with her radiance. May 21st. At ten o'clock, she appeared to two persons, and sent a message to another. May 25th.  Ten o'clock. Appeared and conversed with two witnesses, while a third person heard the conversation; and revealed that by which the same was proved to others. May 26th.  She appeared at eight o'clock in the morning, and talked with four persons an hour and a half. In half an hour after, she appeared and talked with the same four persons, while two others heard a voice, without knowing what was said. May 27th. Talked with two persons, and promised to be present at a meeting of about twenty people, which was to be held the next day in the evening. Accordingly she appeared at this meeting to persons who were ignorant of the promise. The assembly was immediately interrupted by the declaration that 'the spirit is come.' The next evening after, she conversed with a couple of persons, and told them by her inimitable voice to whom she had appeared. . . . Her conversation was always with grace, seasoned with salt, very affecting and delightful. August 13th.  At ten o'clock, she talked with three persons invisibly. At two o'clock the same day, she appeared and talked to three people in the hearing of five other persons. Of forty depositions and affidavits given by as many different persons in reference to this remarkable affair, we insert the following as specimens. The first is from one who appears to have been constitutionally sceptical, and whose very circumstantial testimony is on that account all the more valuable. TESTIMONY OF MISS HANNAH BATCOMB. August 9th, 10th. I looked there and saw nothing. Soon after this, while Mrs. Butler was sitting on the foot of a bed, we heard a sound right against her on the outside of the house. Mr. Butler told her to speak to it. At first she refused. They told her she must. I saw her go up into the room, and heard at the same time the voice in the cellar. Mr. Blaisdell asked the spirit whence she came. He did so; and I among the rest answered that I was. Then the spirit said, ' I must appear ; ' and by her direction we placed ourselves in order. Then I saw a white appearance, at first not more than a foot in height, but it appeared larger and larger, and more plainly; and when it came nearer to me, I was struck with fear, and left the cellar; but others told me that afterwards they saw the spirit plainly. August 13th, 14th.  I again went to Mr. Blaisdell's with forty-seven persons. The spirit now told us again that she was from heaven, and that she was once Nelly Hooper. After much conversation, the spirit said that some of the people were faint, and could not hear all that was to be said, and that we must go up and refresh ourselves. We went up immediately and looked on the watch, and it was exactly twelve. In a short time, hearing the usual sign, we returned. Among many other words which I do not remember, Mr. Downing asked the spirit if she knew him; she answered, ' Yes,' and called him by name. He asked her if she was ever at his house. She answered that she had been once there with her mother. Some person asked when she would be ready. She said, ' I will let you know.' Some person again asked what o'clock it was. She answered one. We went up and again looked on the watch, and it was one. We attended prayer, and immediately after she knocked. A psalm was chosen, which the greatest number of us could best remember, and it was sung as we walked. I was now far forward, and did not see the spirit. When we came to Captain Millar's the spirit rapped there, and Captain Millar, with Captain Paul Blaisdell, and some others, went into the cellar, and I heard them talk, but could not understand what was said to them. Then word came to us that we must stand out in the field before the househ that she would appear before us, and walk with Mrs. Butler, that the people might be convinced that Mrs. Butler had told the truth in relating that she had walked with her before. Then we all stood before the house. Mrs. Butler put on a black cloak, and when she had walked a little distance from us, as before directed by the spirit, I heard her groan bitterly, and soon after I saw the appearance of a woman in white walking with her. Suddenly Mrs. Butler sung a part of that hymn called ' New Jerusalem.' Then she came to us, and we all went back in order to Mr. Blaisdell's. I then looked back and saw a person in white, walking with Mrs. Butler. After we returned to the house, Mrs. Butler appeared very weary and exhausted. I asked her at what time the spirit came to her. August 7th. Mr. Blaisdell came to my house, and desired me to go to his own, where I might hear and see for myself. He also went to Capt. Samuel Simson's with the same request. Capt. Simson and his wife, S B , and N G , who were there, came with him to my house, and we all went to Mr. Blaisdell's. When we had been there some minutes, Capt. Simson, by desire, prayed. His prayer was immediately followed by a knocking, and we all went into the cellar. Mr. Blaisdell asked what was wanted, and who it was. It answered, ' I was once Nelly Hooper.' I asked, ' How was man made ?' ' Out of the dust,' said the voice; ' dust thou art, and unto dust shalt thou return. You have the Bible, and that is God's truth, and do you abide by it. Love God, and keep His commandments.' After some conversation with Mrs. Simson and others, she said, ' I must go,' and we heard no more. It was now broad daylight, the outer cellar door being open, and utterly impossible that any living person should be there but those whom we could see and know. The voice was about six feet from me. August 9th. I went to that house with many people, among whom I observed much disorderly behaviour. The spirit spoke but little, and I returned with a resolution to go no more to that house on such an errand. August 14th. Just before daylight, I heard singing as I lay in bed, approaching to my house. Presently, by my leave, my house was filled with people, and I heard knockings on the floor. By the desire of certain persons, I went into the cellar with Capt. Paul Blaisdell. After some discourse of the voice with him, which I understood not, I heard sounds of knocking near me. We went up, and complied with her direction, and I saw a personal shape coming towards us, white as the light. By the spectre's order, as I was informed, Mrs. Butler went towards her, ' Lydia,' said the spectre, ' you are scared, you must sing.' Then she sung a hymn. The spirit came almost to us, then turned, and Mrs. Butler with her, and went several rods towards Capt. Simson's, and appeared to take her by the hand, to urge her on further, and disappeared in our sight. 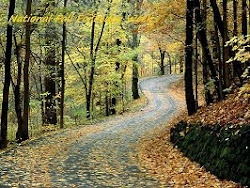 Mrs. Butler returned, and informed the company, as I was told, that if they would walk to Mr. Blaisdell's solemnly, as to a funeral, the spirit would walk with Mrs. Butler, behind them. The company did so. But I, being far forward, saw nothing. "James Millar." testimony of Mrs. Mart Jordan. On the 4th of August, 1800, about two hours before daylight, while I slept at Mr. Blaisdell's house, I was awaked by the sound of knocking. 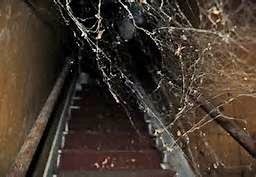 I got up, and with about twenty others went into the cellar. There I heard a voice speaking to us, as I never heard before nor since. It was shrill, but very mild and pleasant. Mr. Blaisdell, addressing the voice, said that several persons (of whom I was one) had come from a distance to obtain satisfaction, and desired that she would tell us who she was, and the design of her coming. She answered that she was once Nelly Hooper, and after she was married became Nelly Butler. After much conversation of a religious nature, she appeared to us. At first the apparition was a mere mass of light; then it grew into a personal form, about as tall as myself. We stood in two ranks, about four feet apart. Between these ranks she slowly passed and repassed, so that any of us could have handled her. When she passed by me, she was so near that if she liad been a substance I should certainly have felt it. The apparition had a constant tremulous motion. At last the personal form became shapeless, expanded every way, and vanished in a moment. Nothing more being now seen or heard, we were moving to go up, when the voice desired us to tarry longer. We did so, and the spirit talked with us another hour, even till broad daylight. She mentioned to us the ill-treatment which Mr. Blaisdell's family had suffered by reproach and false accusation, and told us they Would on her account be yet more despised and ridiculed. Her discourse concluded by a solemn exhortation. After speaking much more that I cannot remember, she sang praises, and left us. Her notes were very pleasant. Her words were no higher than common, yet they were exceedingly impressive. Mary Jordan. testimony of Mrs. Wentworth (sister of the apparition). On the 2nd of January, 1800, Hannah Blaisdell came to Mr. Butler's house, and informed me that the extraordinary voice which they had heard, had declared itself to be that of my sister, and that I must go to her father's house. I replied to her face that I did not believe it. The next day I received the same message from three other persons of other families, to whom I returned the same answer. Nevertheless, I was at last persuaded, and accompanied Capt. Butler and my husband to Mr. Blaisdell's house. Capt. Butler and I examined the cellar with a candle. Capt. Simson and some others went with us. I held Lydia (Mrs. Butler) by the arm, when we heard a loud knocking, and the sound of a voice which brought fresh to my mind my sister's voice. This voice spoke several sentences, which were such as my sister used to utter, and from this time I cleared Lydia of the voice, and accused the devil. August 8th. Was there again with about thirty others, and heard much conversation. The voice was still hoarse and thick, like that of my sister on her deathbed, but more hollow. Sometimes it was clear and pleasant. August 14th. I heard the same voice in the same place, and did then believe it was my sister. She talked much with Capt. Simson, and exhorted the people. I heard a private conversation which I had with my sister in her life-time, and which I had never repeated to any one. We were alone together; but may it not have been overheard by some evil spirit who now personates my sister? I know of no reason for her coming. TESTIMONY OF MR. JAMES SPRINGER. We walked in order, two and two, to the house, and I saw the spirit appear and dis- appear several times. Whilst we were at Capt. Millar's house, we stood in the field, whilst Mrs. Butler, in great fear, walked with the spirit, before our eyes, a few rods towards Mr. Simson's. Then Mrs. Butler came to us and said we must return to her father's house, two and two, singing a hymn, and she and the spectre would walk with us. We did so. Mr. Paul Simson and I walked behind, if possible to see the apparition. When we had walked about fifteen rods, I saw a white appearance to the left hand. As we passed it, it fell into rank, and walked with Mrs. Butler. Mr. Downing and I turned and looked upon them, and heard them talk. We kept walking on, then stopping to look at them, all the way. We heard them speaking all the time, but in a low voice. The spirit appeared in a personal form, with arms locked, as white as snow, and about as tall as Mrs. Butler. Soon after daybreak I saw it plainly vanish. James Springer-- Most of the affidavits are to the same effect as the above. Many of them state that the spirit often appeared, bearing a very small child in her arms. That the particles of luminous matter that seemed to compose her were tremulous, in constant motion, presented no resistance to the touch, and were always white and shining. All the witnesses saw her with more or less distinctness, and all heard her voice, and bore testimony to its remarkable shrillness, and inimitable peculiarity. August 9th, when, as I have said, there were gathered some of the best of people, who conducted themselves with order and reverence ; but others there were, who uttered such profanity and derision as rendered them unworthy to obtain conviction; and thereby, as the spirit afterwards declared, she could not manifest herself amongst them, so that save some knockings and a few sentences spoken, no tokens of her presence could be given. The spectre gave a number of extraordinary messages, of which the marriage was but one, and that a subordinate one to other ends of far superior magnitude and importance. These superior ends you will know hereafter, but they cannot, they must not be written. No doubt can exist that if the parties interested in these strange phenomena could have considered and investigated them with the same practised coolness that characterizes the visitors of our modern spirit circles, most valuable and important views of spirit life, its laws and conditions, might have been gathered from such unusual opportunities for the enquiry; but amidst the fear, ignorance, and superstition which have for centuries obscured man's views of spiritual existence, it was next to impossible that even one risen from the dead should be able to bring conclusive evidence of her presence, or inform the prejudiced and bigoted concerning the true conditions of spirit life. Still, the details of this remarkable case are too circumstantial and well attested to leave room for doubt concerning its main facts, and they unquestionably form one of the most singular and authentic evidences of direct spirit communion that the annals of history can furnish in America, prior to the great outpouring from which the modern movement of Spiritualism dates in 1848." 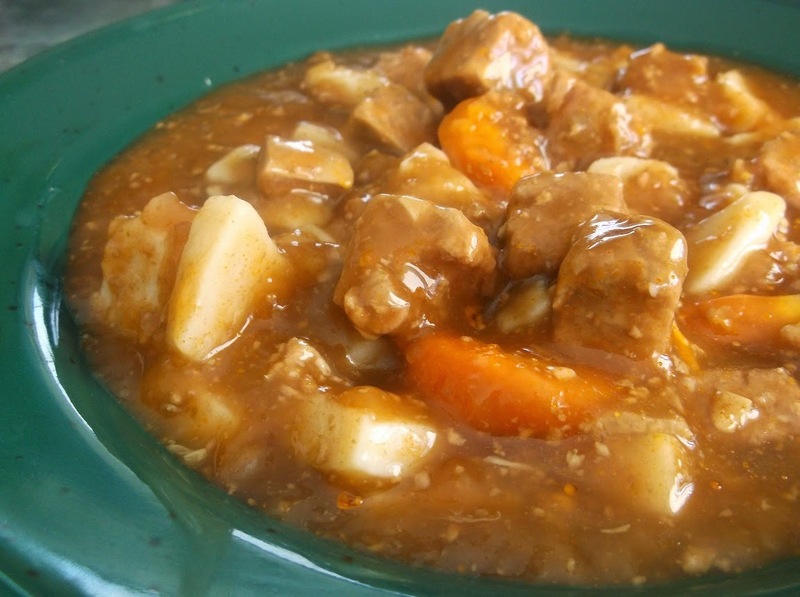 I just remembered 2 days ago that St. Patricks Day was a mere few days away and I am in a rush now to offer some tweaked Irish dishes for everyone to enjoy. 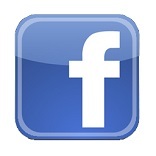 On my website, theyankeechef.com, I have a great assortment of Irish recipes, but every year I add more and more. That is until this year. I usually start many weeks previous to the celebrations, but with my new time constraint, I am giving you some of my favorite recipes I have had tucked away for just such emergencies. So let's begin here on my blog. 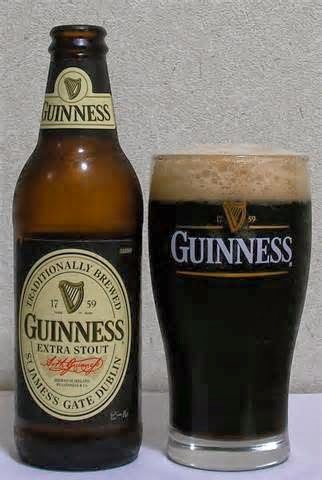 As you will see below, I use stout for an authentic taste of Tipperary. Dry stout is Ireland's claim to beer fame. It is a unique tasting brew, almost black in color, very rich in flavor and has a 'roasty', almost chocolaty flavor. Irish stout is drier than most English brews, with Guiness leading the pack the world over. Murphy's and Beamish, however, are just as popular in the Emerald Isle. Lager is made with pride(such as Harp)and equally enjoyed by the Irish as well and can be used in these recipes easily. Irish ham is brined and smoked in such a way that you would be hard pressed to find a comparable tasting ham. I adore Irish ham and it is readily available in most supermarkets no matter where you live, just ask the deli clerk. 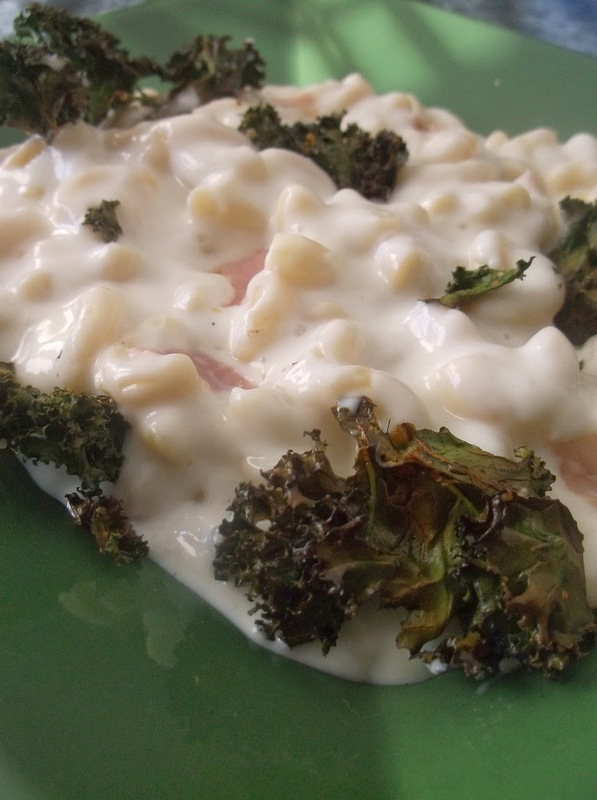 This Mac and Cheese has great Irish crunch from the roasted, seasoned kale, superior Emerald smoothness with the cheese and it is super simple to make. Preheat oven to 350-degrees F. Rinse and dry kale leaves, cutting out the tough, center stalks. Tear them into bite-sized pieces and toss them with the olive oil and 2 tablespoons Parmesan cheese in a bowl. Place them on a pan and bake for about 8-9 minutes, or until crispy, browned but not burnt. Keep an eye on them, some may crisp up faster than others so open oven to remove the crisp ones while continuing to cook remainder. Remove from oven while preparing remainder of recipe. Leave oven on. In a medium skillet, over medium heat, add the cubed ham and 2 tablespoons butter. Cook ham, stirring frequently, until lightly browned, about 3-4 minutes. Add stout and continue cooking and stirring until liquid has almost entirely evaporated, about another 3-4 minutes. Remove from heat; set aside. Cook macaroni according to package directions; drain and set aside but do not rinse. In a large saucepan, melt remaining butter over low heat; when melted, whisk in the flour until smooth. Raise heat to medium and add milk and pepper, whisking well. Continue cooking and frequently whisking until thickened, about 2 minutes. Add cheese, whisking until melted; remove from heat. Add the macaroni, ham, remainder Parmesan cheese, stirring to combine. Transfer to a 2-quart baking dish and bake for 25-30 minutes, or until bubbling. Serve with the crispy kale thrown on top of each serving. A hearty recipe that truly harbors the flavor of the Emerald Isle. I could have tweaked this recipe here and altered it there, but why mess with a dish that simply is great the way it is? As many of you know, lamb is my favorite protein so I wasn't about to play with this great, Irish dish. Heat oil in a large 5-quart pot over medium high heat for a minute. Add half the lamb to lightly brown on all sides, turning frequently, about 7-8 minutes. Transfer to a plate and continue with remaining lamb. Remove that lamb to a plate and add the carrots, onions and celery. Reduce heat to medium and cook about 10 minutes, or until celery is softened. Add lamb back into pot with broth and all stout. Cover and simmer over medium-low heat until meat is tender, about 20 minutes. Remove lid to add potatoes and cook an additional 10 minutes, covered. The potatoes should be just soft when pricked. Stir in the cornstarch slurry,well,and continue cooking until stew has thickened,about another minute or two. Makes enough for 1 Yankee or Irishman..... 3 servings for everyone else. Rather than using a quarter of a cabbage while watching the rest of the head shrivel and dry in the fridge, why not buy a bag of shredded green and purple cabbage and carrots and slightly cook them for a great side dish to your Irish table? I personally love the crunch of crisp-tender veggies in my Colocannon, pairing well with just right cooked corned beef. Normally cheese doesn't belong with Colcannon, but I truly believe once you tasted true Irish cheese, you will love it as well. Cover potatoes with at least three inches of water and cook over medium-high heat until done. Meanwhile, in a large skillet, add the garlic and butter. Cook over medium-high heat until garlic is fragrant, about 1 minute, stirring frequently. Add the coleslaw mix, stirring well and cook for 3 minutes, tossing frequently, or until slightly tender but with plenty of crunch. 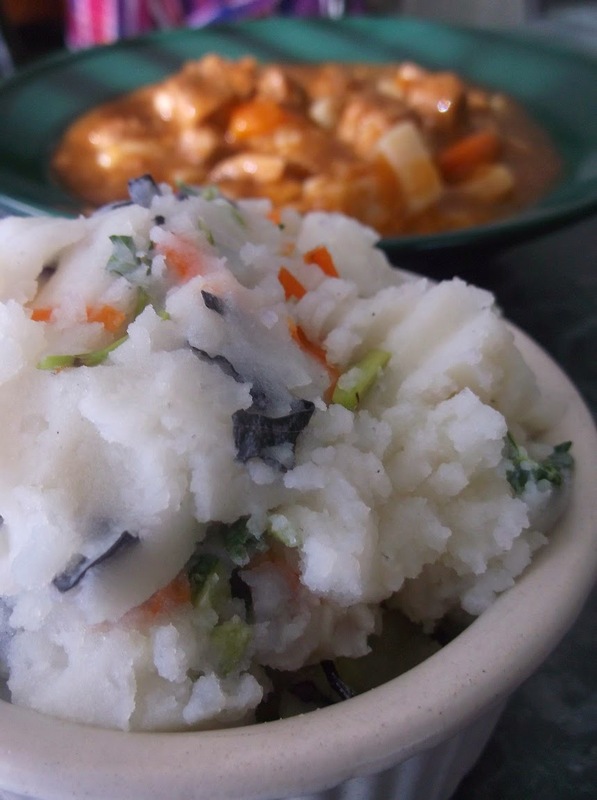 Cook longer if you don't desire the vegetables to be crunchy in the mashed potatoes. Reduce heat to low and add milk, salt and pepper to taste. Bring milk to scalding but do not boil and then turn off heat. Drain potatoes and mash by hand or use a mixer. Fold in the milk/coleslaw mixture until well blended. Adding sharp Vermont Cheddar in a recipe from or Yankee counterparts recipe is the perfect compliment to each other. There is something about melted cheese coming from a crispy exterior of a soft, mashed potato pancake. 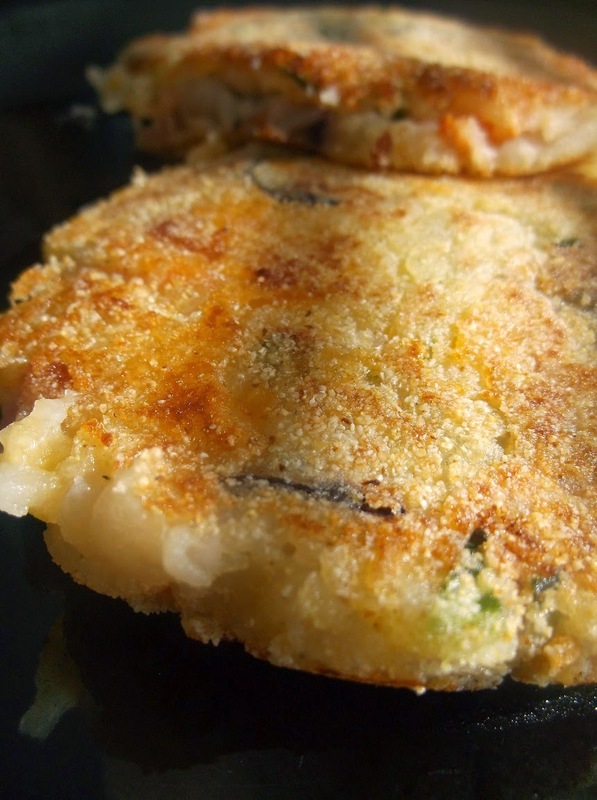 This recipe is geared for leftover potatoes but why not make Colcannon Potatoes ahead of time and grill up these tasty patties for your Irish table? In a large mixing bowl, loosen up(or remash) the potatoes with a masher or fork. 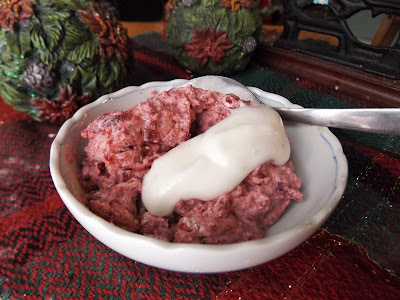 Fold in the corned beef and form into four 1/2-cup measure balls. Make an indent in each to fill with a tablespoon(or more if you prefer) cheese. Close the gap and flatten out to an inch in thickness. Place in refrigerator for 30 minutes. Meanwhile, heat oil in a large skillet over medium heat, nonstick pans are best. Place the cornmeal in a shallow plate. Remove potatoes from fridge and dredge both sides of each potato patty with cornmeal, pressing firmly. 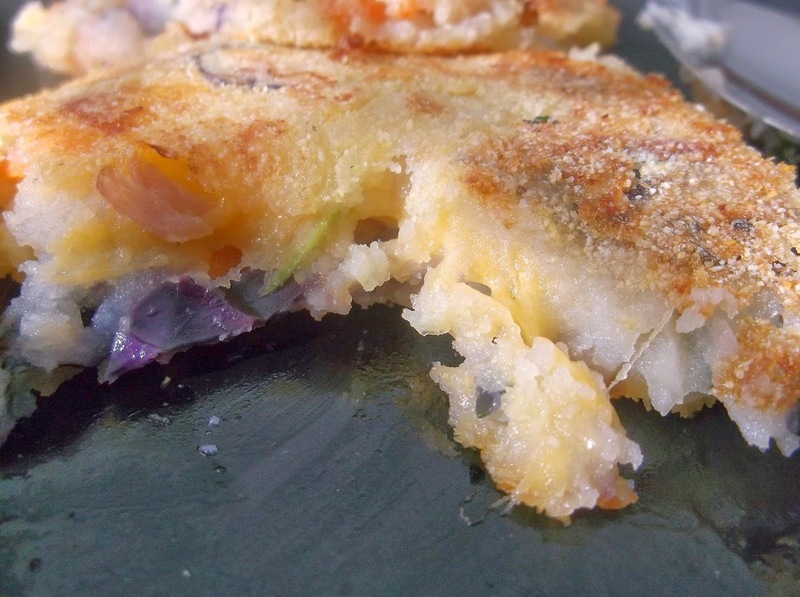 when oil is hot, add the Colcannon Cakes and cook for 4-5 minutes per side, or until well browned. Remove and serve. 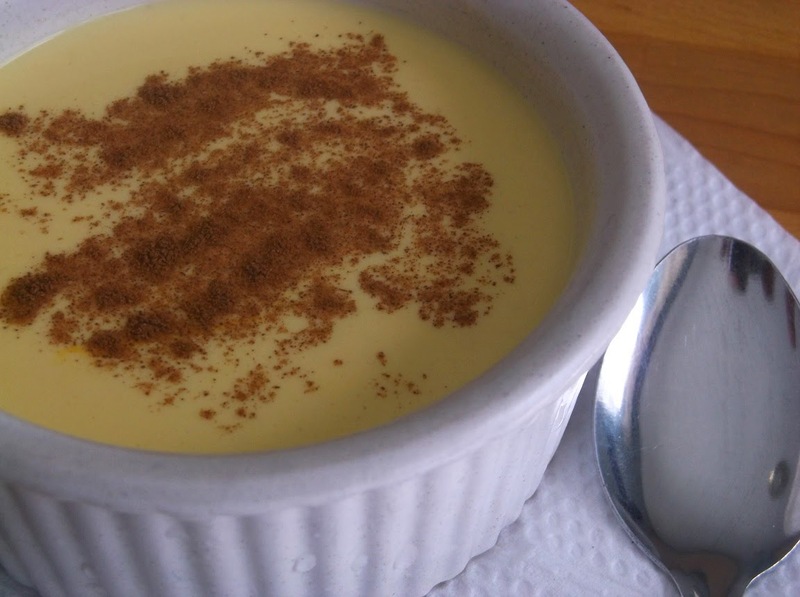 These "custards" are as smooth as the meadows of County Mallow with just the right amount of Irish flavor. This is one of those desserts that I feel needs no adornment, such as whipped topping, but if you desire, whip some up, blending some more Irish liqueur into the whipped cream for a more festive, green accent. Preheat oven to 325-degrees F. In a saucepan, heat the milk over medium-low heat until it is just simmering, stirring frequently. Immediately remove from heat. Meanwhile, whisk together the yolks and sugar in a bowl until as smooth as possible. Whisk a half cup of the hot milk into the yolk mixture and then whisk all of the tempered yolk mixture into the pot of milk. Whisk well along with the liqueur. Evenly pour mixture into six 4-ounce ramekins or bake-safe serving cups. Sprinkle each with nutmeg and place in a large baking dish with sides at least 2 inches high. Pour hot water so that it comes up about halfway up the sides of cups. Bake for 35-37 minutes, or until the centers are just set. Remove from oven and water bath to cool completely in refrigerator at least 3 hours or until completely set. I don't know why no-one has ever attempted to make Cannoli's without cannoli forms before. Who makes cannoli's so often at home that you find yourself needing a form, let alone trying to find one in the nearest store? Although I adore these sweet Italian favorites, I don't make them as often as I should. Now here is a unique way of making these sweetened, crunchy, hand-held treats without bothering with the forms. Nothing has changed in the taste of my cannoli's compared to professionally made you find at restaurants and bakeries(Well, maybe for the better). There are, however, two things that stand out here. First, anyone can do mine with no extra utensils than what you have at home. Secondly, my recipe is crispier and can withstand the dampness of the cheesy filling without getting soggy. So by all means, make these ahead and haul them out when you want. I am proud to be able to YANK recipes for the home cook and even prouder when professional chefs get just a little tweaked when it comes to playing with a classic. But why not tweak something in order for everyone to enjoy it? 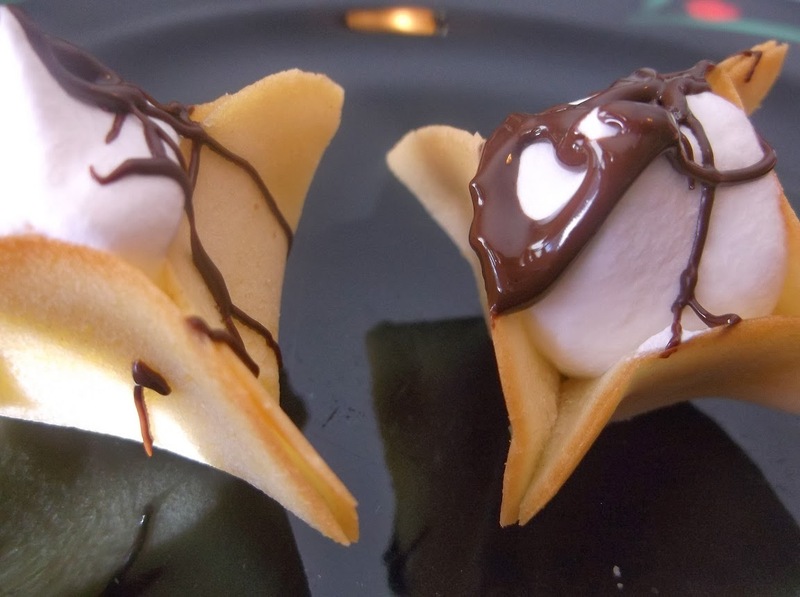 These taste BETTER than prepared cannoli shells, and as mentioned, they stay crisp(which will have even children devoouring them for the first time). So 'BAM' is out, 'YANKED' is in! These are so perfectly balanced between sweet and crispy, I would never buy cannoli's unless I had no other choice. 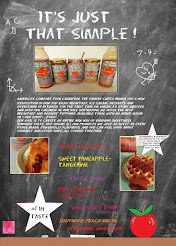 I think you will agree that this Yanked recipe will be your favorite Italian finger food as well. You may also opt to spend a little more money on the filling by substituting mascarpone cheese for the ricotta. Certainly this is fine, but allow the mascarpone to come to room temperature before mixing. Preheat oven to 350-degrees F. Spray(or grease) 2 baking sheets liberally with nonstick cooking spray. Add butter to a microwavable bowl and heat, on high, for 1 minute, or until just melted but not scalding hot, making sure you cover the bowl. Let come to room temperature and beat in egg whites and vanilla. Whisk the powdered sugar into butter mixture until completely smooth. Add the flour and continue mixing until smooth. Drop about a 2 tablespoon amount of batter onto cookie sheet. With the back of a spoon, spread batter to form a 6-inch circle, making sure the batter is evenly spread. Do the same with another mound of batter, at least an inch from the first. Bake for 4-5 minutes in the upper third of the oven, or until slightly browned around the edges. Remove and loosen with a spatula. Let sit for about 30 seconds, or until starting to stiffen. Working quickly, roll the cannoli so the one side overlaps the opposite side. Set aside, resting seam-side down. The shells will hold their shape easily, and harden quickly. Repeat with other shell. Continue with remainder of batter. While cooling, make cannoli filling. Dip each end of the shells into melted chocolate. Put cannoli filling into a plastic baggie and snip off a corner. Fill each shell and dust with additional powdered sugar if desired. Makes about 6-8 cannoli shells. A delightful balance of sweet and salty. 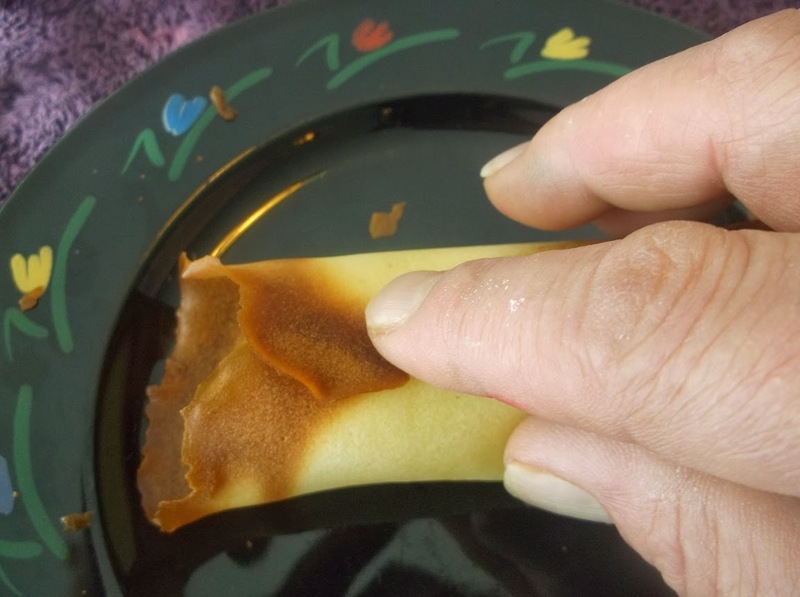 Many chefs add cinnamon and even bits of chocolate in their filling. I adore the subtle taste on the outside of the shell, as directed above, but by all means be creative. Have fun and have at it! Empty ricotta cheese into a fine-meshed strainer and let drain for 30 minutes. Transfer to a large bowl and beat in powdered sugar until well blended. Mix in extract and Grand Marnier, if using. To make Mini Cannoli Cups, follow the above shell recipe but scoop out a teaspoon of batter onto prepared baking pan. Bake for 3-4 minutes or until they start browning around the edges. Remove, loosen with a spatula and form into "bowls" by pinching 4 corners to form a square on top. 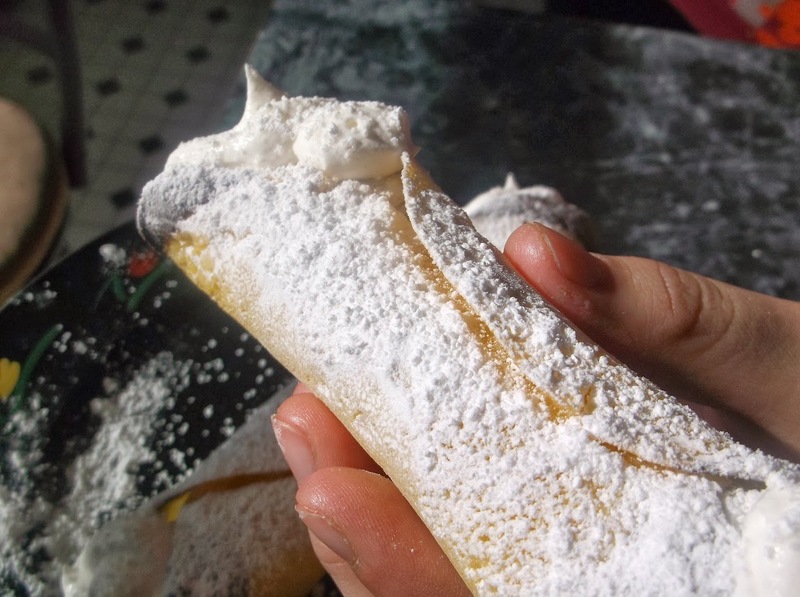 Fill with cannoli fillling when cool and drizzle melted chocolate over the top. For Cannoli Scoops, follow the Mini Cannoli Cups recipe but form a teaspoon of the batter into oval shapes on prepared pan. When cooked, pinch together one end of the baked oval, forming a handle. 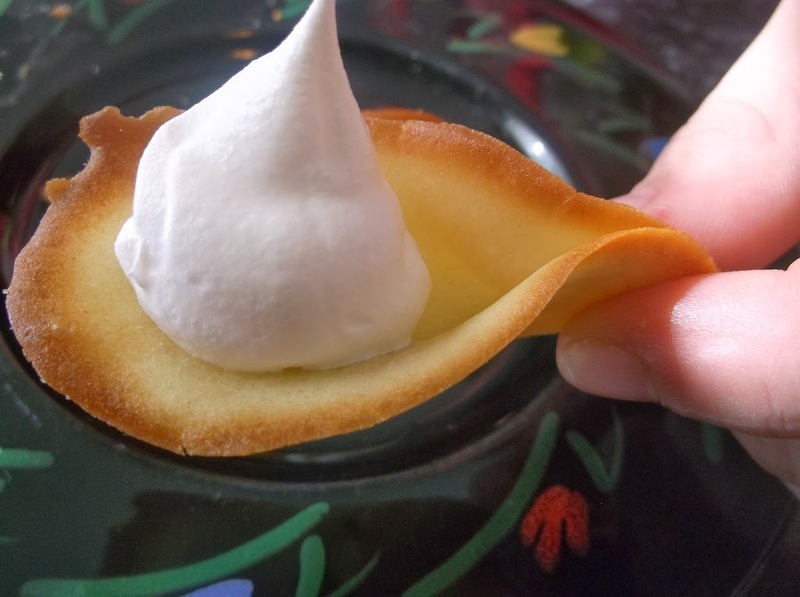 The "spoon" part will form itself, which is perfect for dipping into a bowl of Cannoli Filling.